The plant was brought online in just 19 months, adding further Nissan Americas capacity as a multi-platform, flexible assembly plant that can be utilized for most of Nissan's global vehicle platforms as needed. 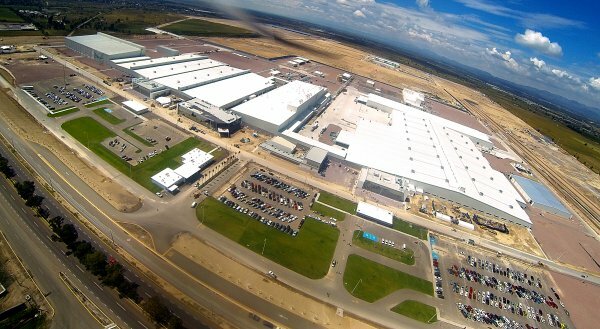 This puts Nissan's operations in Mexico very near a 1 million vehicle capacity. Nissan's Power 88 growth strategy includes aggressive expansion of manufacturing capacity globally, with key areas being in the Americas and China. A big step forward in that plan came to fruition today with the completion of its latest vehicle plant in Aguascalientes, Mexico. The plant is the first phase of a $2 billion complex to be built on the site and is the most important portion of it, being the main production facility. This is Nissan's third plant in Mexico and has been designed to be flexible in its platform production capability, able to handle any of Nissan's global platforms, from small cars to commercial vehicles. During the opening ceremony, Carlos Ghosn, president and CEO of the Renault-Nissan Alliance, highlighted Nissan Mexicana's position as a global benchmark for the corporation. "Nissan Mexicana is a global benchmark in manufacturing, productivity, competitiveness and customer satisfaction," Ghosn said. "The investment in our third vehicle plant in Mexico leverages the world-class manufacturing capabilities of the Nissan Mexicana team and is aimed at satisfying the high demand for Nissan vehicles produced in Mexico throughout the Americas and beyond. It will help consolidate our leadership in the domestic market and strengthen our growth plans globally." Currently, Nissan produces one of every four cars being made in Mexico. Most of these cars are shipped to the international market. Groundwork on this new plant began in April 2012 and involved 2,500 people and over 7,000 tons of steel to build. The plant totals five buildings and 1,942,491 square meters of construction on 1,130 acres. The Aguascalientes houses many firsts, including the the largest stamping plant in Latin America, and one of the most advanced paint shops in the region. Environmentally minded design influenced the development of the Aguascalientes 2 plant as a whole. Seven percent of ceiling parts are translucent, allowing for natural light to flood operations throughout most of the day. A zero-discharge, water treatment recycles water used for internal and landscaping services. Moreover, a portion of the land was prepared as an environmental reserve, including fertile soil moved during the development process and native plant species. The reserve is being designed for the leisure use of employees and the community. The plant's first vehicle for production will be the 2014 Nissan Sentra for export markets, especially into South America and the near-Pacific.